Click here to donate to our fellow citizens in Puerto Rico who need our help. Last Thursday, I traveled to Puerto Rico to cover relief flights and JetBlue’s operations at San Juan’s Luis Muñoz Marín Airport (SJU). While the airport is back up and running, with dozens of daily flights, Puerto Rico clearly felt like an island still reeling from a record-breaking hurricane and crumbling infrastructure. I began my journey to San Juan on United Flight 1523 from Newark. I didn’t want to use up any of the island’s limited resources, so I just visited for the day and brought along my own food. I booked the trip Wednesday night, paying $148 for a one-way flight from Newark to San Juan that cleared instantly into business class — in fact, many of the seats in both cabins on the 767-400ER ended up going out empty. I chatted with some folks at the gate, but my first notable interaction was with my seatmate Joseph, who runs a flooring company in New York City. This was the first flight to Puerto Rico he was able to book following the hurricane, and he was eager to visit his family and help evacuate his mother from the west side of the island. Joseph was also carrying some 500 pounds of supplies, including cases of water, protein bars, canned foods, mosquito repellant, batteries and solar chargers, satellite phones and even candles for his family to use to light their home at night, since it could be months until power is restored. In total, he paid United $850 to check all of that extra luggage, but with FedEx and UPS refusing to accept his shipment, he didn’t have a choice but to bring it all on the plane. We chatted for much of the flight, which was otherwise uneventful — at least until we began our descent for SJU. While the city of San Juan looked just as I remembered it from a distance, a closer look revealed flattened homes, damaged trees and other devastation. And while much of the airport was still intact, one terminal lost its roof, as did some hangars. The hurricane even destroyed a single-engine plane, which was still resting against a hangar wall, right where the winds had left it. After a short taxi around the airport, we pulled up to the terminal and deplaned — there was air conditioning, electricity and a fair amount of hustle and bustle. 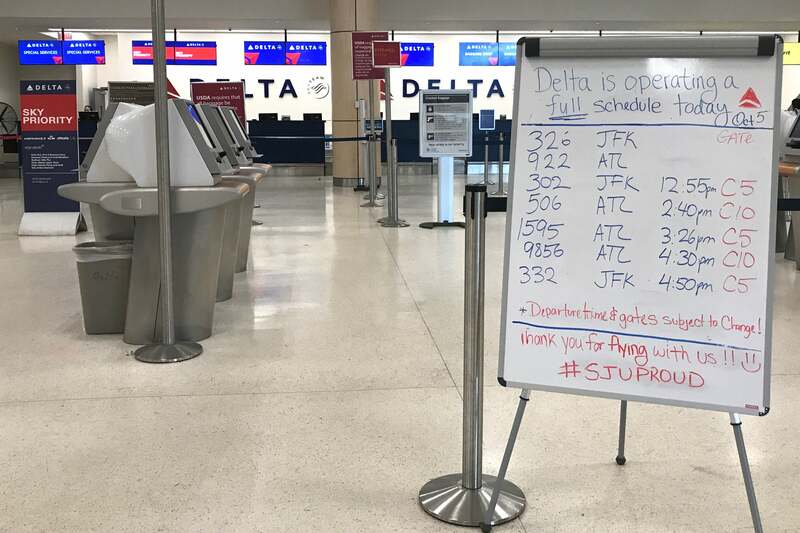 In fact, had it not been for the nonexistent Wi-Fi and cellular data, my first impression of SJU wouldn’t have been any different than during my last visit in 2016. 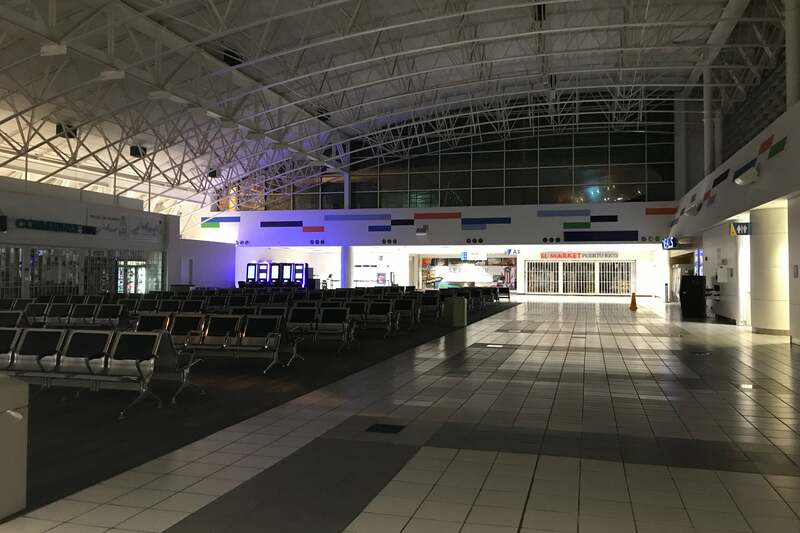 Even though I had decided to book my trip just hours before, the JetBlue team was able to arrange a meeting with Franky Elias, the airline’s General Manager for the Fort Lauderdale hub, who was temporarily running the operation in San Juan. At its peak, JetBlue operates up to 40 flights per day to and from San Juan — 15 or so were operating during my visit last Thursday. According to Elias, the airline has been able to accommodate any passengers in urgent need of evacuation on the same day they arrive at the airport — elderly travelers and those in need to medical care are booked on the next flights, and have been since operations resumed shortly after the hurricane. Fares are capped at $135 for flights to and from the mainland and $129 for flights to and from the Dominican Republic, for travel through November 15, though I’m actually seeing fares available for under $100 on many dates. JetBlue is waiving pet fees, in addition to those for the first two checked bags. The airline’s been flying in relief workers to cover for Puerto Rico locals, so they can care for their families. Employees come in from other hubs, including Boston, Fort Lauderdale, New York and Orlando, and each work five days at a time. They were sleeping on cots in the terminal right after the hurricane, but now they’re able to catch some shut-eye in nearby hotels — due to a hotel room shortage, visiting employees get access to beds on shifts, with one person using the bed while another works in the airport. Employees from other hubs are running the entire operation, from check-in to baggage handling to management. Some are also there to staff JetBlue’s fantastic Care Center, a “makeshift Costco” in a nearby hotel ballroom that stocks everything from batteries to baby formula. The airline’s Puerto Rico employees can take anything they need, free of charge, and the staff will even deliver items if required. 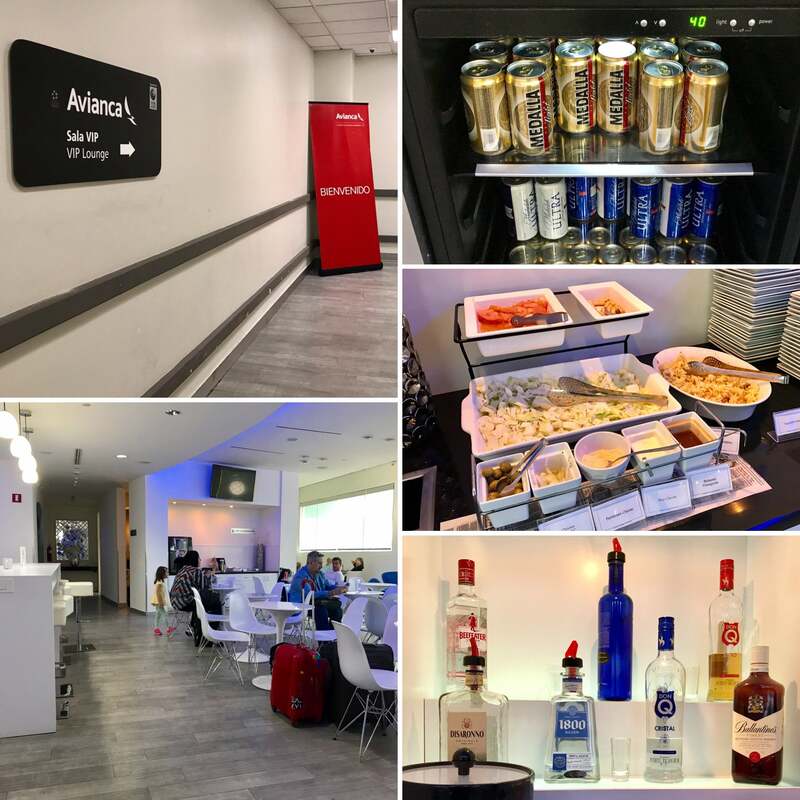 The airport has plenty of food and drinks available for purchase as well — nothing seemed to be in short supply during my visit, though connectivity is incredibly hard to come by, as are hotel rooms. The ATM lines were often a dozen or so people deep as well, since most ATMs were out of order. The handwritten flight boards are also an unusual sight, though the airport’s digital display is working, too. The infrastructure has come a long way since the hurricane — employees were handwriting boarding passes and luggage tags on the first few days, but now even the kiosks are available for check-in. The TSA lines were especially light — during the peak early afternoon hours, I only saw a dozen or so people waiting for screening. 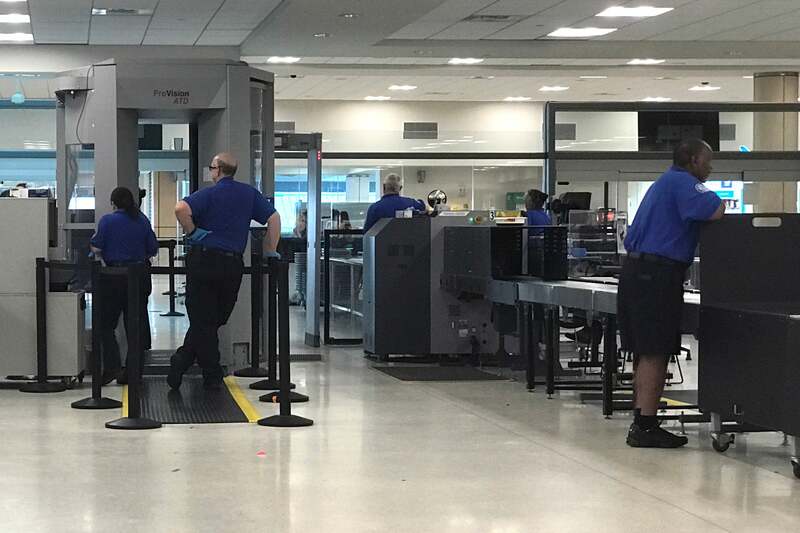 Like the JetBlue airport workers, all of the TSA employees are on loan from other airports around the US. While the retail spaces were closed immediately following the hurricane, most have since reopened. 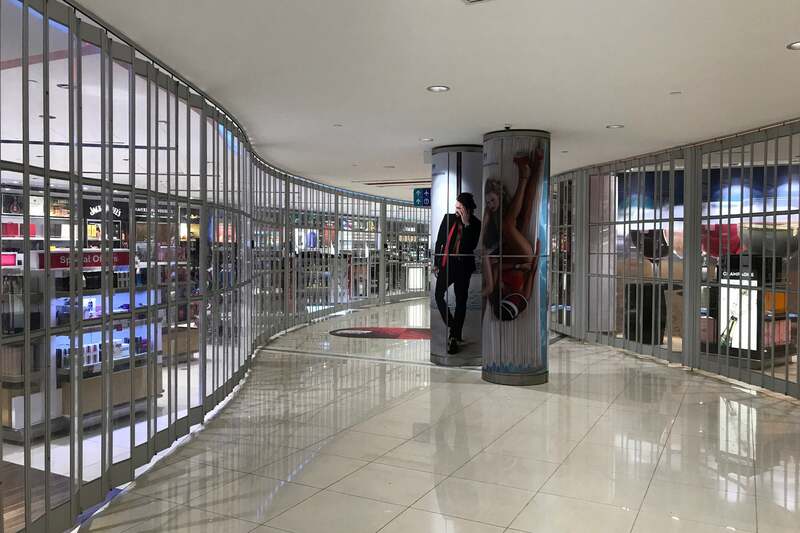 All of the duty free stores were fully stocked and staffed, for example, though I didn’t see anyone making purchases at any point during the day. Drinking water is in short supply on the island, but there seems to be plenty of alcohol available at discounted rates at airport shops. Nobody seemed to be in the mood to make a purchase, though. Souvenir shops are up and running as well, though there aren’t any tourists to shop at them. Some stores and restaurants remain closed. 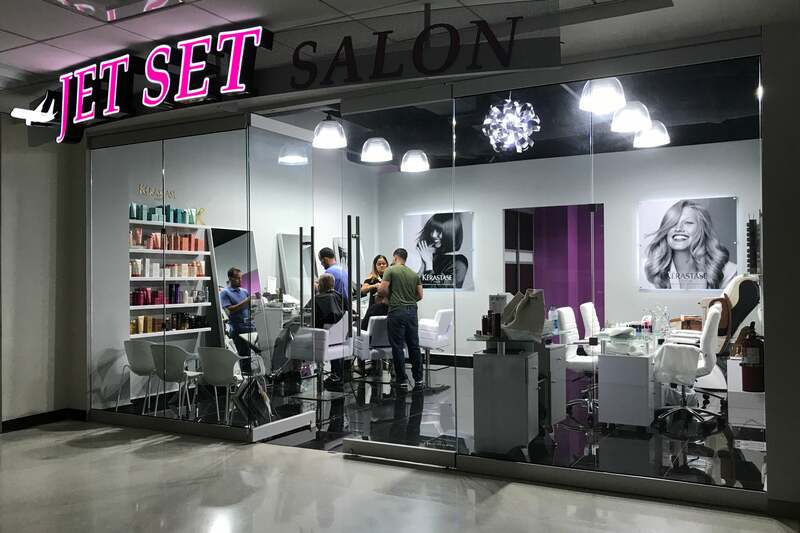 The Jet Set Salon was fully operational, with several customers getting their hair cut. Avianca’s Sala VIP lounge was also ready to welcome guests, though it closed at 7:00pm in order to give staff plenty of time to make it home before Puerto Rico’s midnight curfew. There were snacks and plenty of drinks available, though the Wi-Fi wasn’t working. Many of the restaurants were open for business, too. 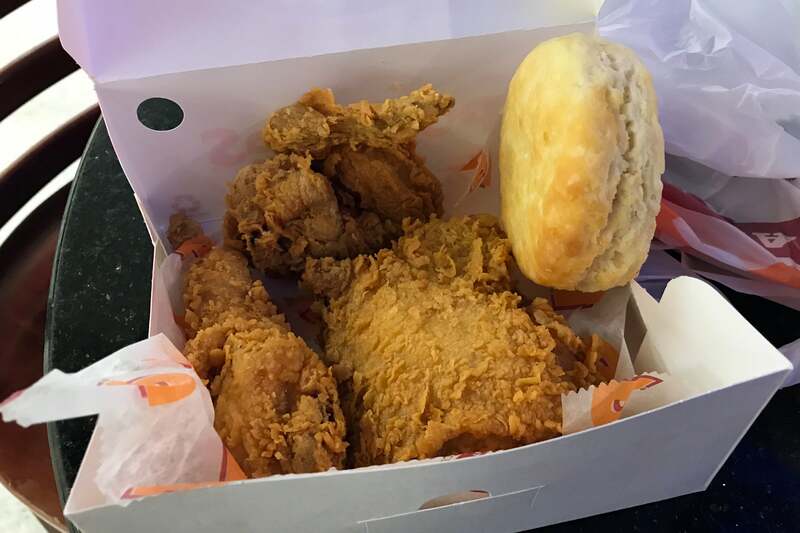 The granola bars I had brought along ended up leaving me pretty hungry, so I decided to swing by Popeyes for some fried chicken. There were a few pieces left as the staff was getting ready to close up shop a bit after 7:00pm — the food was hot and fresh, just as I remember it on the mainland. 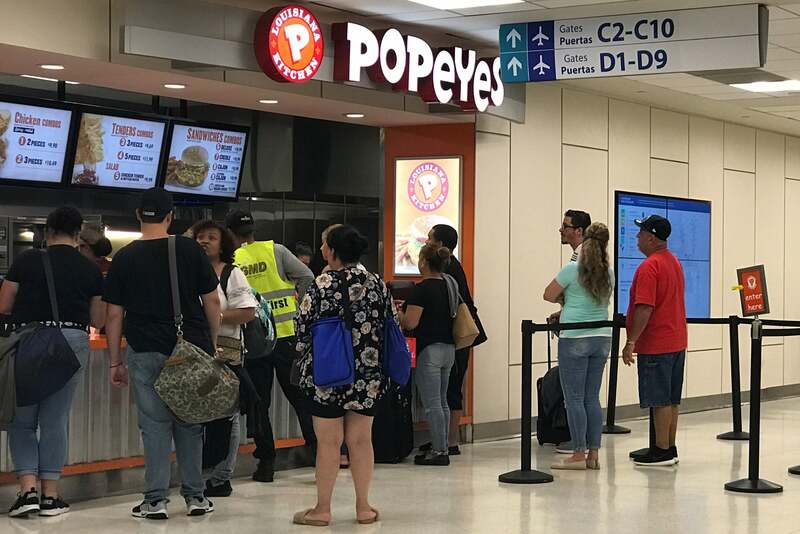 With connectivity down, Popeyes was only accepting payment in cash, though a convenience store was able to process the $20 voucher I got from United to tide me over during our five-hour delay. …and even some of the terminal areas. 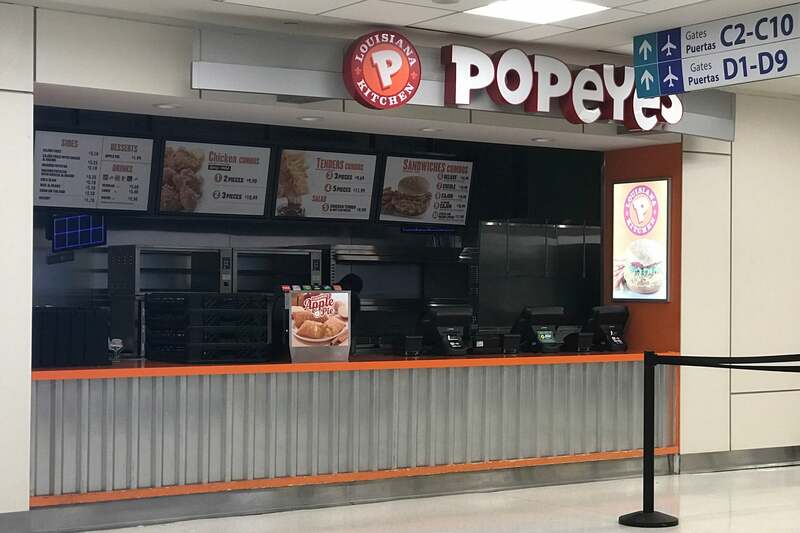 Popeyes was shuttered when I walked past en-route to my departure gate. I had originally hoped to join United’s 777-300ER relief flight from Houston to San Juan, but most of the seats ended up getting blocked so the plane could take on additional cargo. United also had to load it up with enough fuel to make the return trip from San Juan to Houston, since it wasn’t possible to refuel at SJU. You can read all about the relief flight here, which carried 51,000 pounds of donations from Houston residents, including water filters, diapers, food, cleaning supplies, flashlights and more. I did catch the plane on its return flight to Houston, which, believe it or not, went out with 50 empty seats, including a bunch in the Polaris business cabin. Our departure was delayed some five hours, but not due to an issue in Puerto Rico — a mechanical delay on the Chicago-Houston leg early Thursday morning was to blame. From Spirit to JetBlue, the airlines serving Puerto Rico have really stepped up, donating supplies and cargo space on dozens of relief and evacuation flights. I was especially impressed by JetBlue’s operation — the Care Center in particular. Right now, most of Puerto Rico is still without electricity and running water, and residents are still in desperate need of our help. Based on what I’ve seen and heard, it’ll be months before hotels are ready to welcome tourists once again — as tempting as it may be to book a discounted flight and score a cheap getaway, this is not the time. Do not book a flight to Puerto Rico expecting to find accommodations once you arrive. I have been seeing plenty of availability for departures from San Juan, however, so if you have any friends or family members that are looking to leave the island, you should be able to book them a flight out within a day or two either online or by calling the airline’s reservation line. 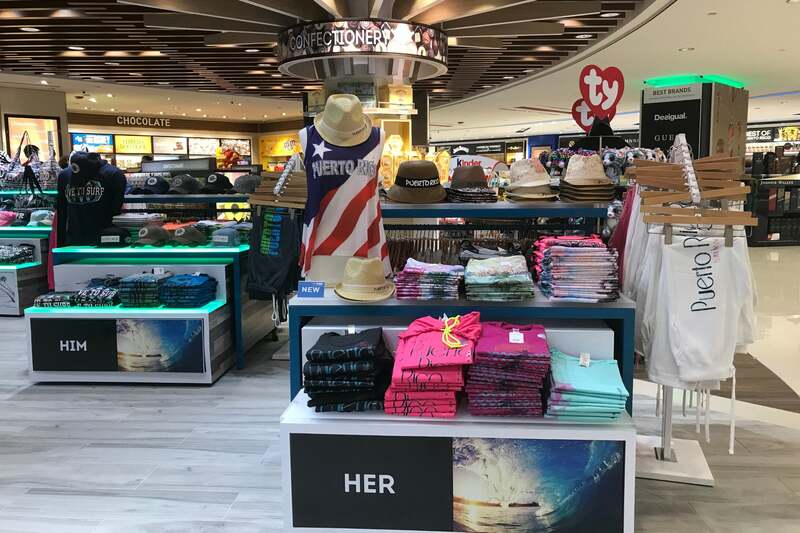 Travelers who head to the airport will have access to JetBlue’s capped fares at the counter, too, and airport agents may have access to additional inventory, so that’s an option to consider as well.